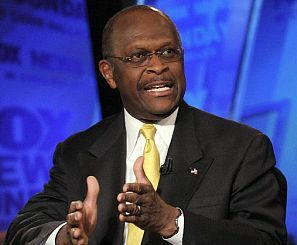 Herman Cain scored an unexpected, and rather stunning, victory in today's Presidency 5 straw poll in Florida. Mitt Romney and Rick Perry had been expected to be the top contenders in the Florida GOP event, but Cain took the straw poll by storm. After an initial (and massive) surge, Rick Perry has had a difficult few weeks. This is a painful end to the week, as it continues the story-line of Perry's campaign troubles. Also surprising about this poll was that Ron Paul (well known for targeting straw polls) came in fifth, and Michelle Bachmann came in a very distant dead last. Bachmann and Romney did both skip the event, but in a gathering of party faithful in a contentious primary, one would expect their numbers to have been higher (particularly Bachmann's). This is very good news for Herman Cain, and will give some much-needed wind in his campaign's sails. Presidency 5 organizers like to tout the fact that the winners in their three previous straw polls (1979, 1987 and 1995) went on to become the Republican nominee every time. Good for Mr. Cain! He is not my first pick but I am pleased the people in Florida did not let the meedeeah select their candidate. Cain did good job in the last debate, even though he's been getting the easy "give away" Non-challenging questions of ALL the candidates. Such as: "Tell us about your cancer & how you would of died under obamacare". DUH!!! Pulezz! That was an absolute gift. However, I think the straw poll result will not have the affect that Gov. Scott predicted it will have. IMO, the straw poll winning by Cain was not because he's electable, but that its the voters way of telling Perry that he'd better get it together; and that Mitt is not going to take the south. I also think this FL straw poll is just a snap shot in time that will prove that it does not always predict the winner of GOP nomination. But time will tell.